This is a joint project that I completed with my 7 year old niece. It's a bit wacky spectacky, but she loves it. 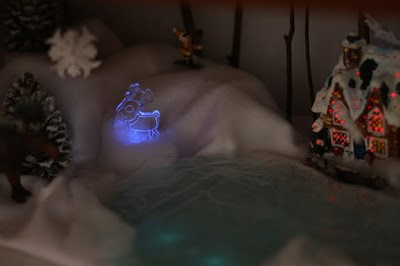 This is our diorama we whipped up for our amusement this year. 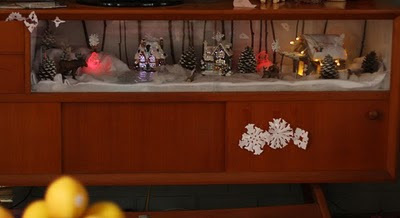 Since it's sans snow around here at Christmastime we thought we would bring a Christmas winter wonderland to our new cabinet. I must admit my purchase of new cabinet was based heavily on that little window display area. Although it does have a great sliding bottom storage area as well. It's a 70's number and is actually made in Australia - rare these days! 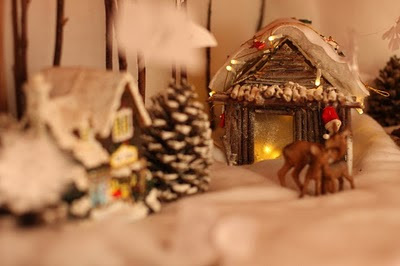 I got quite giddy thinking up all the dioramas I could produce and display throughout the year. I remember, being fascinated, watching lots of American TV shows as a kid and American kids always seemed to be making dioramas for their school projects. 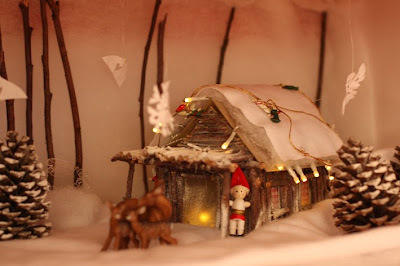 I don't remember ever making a diorama for school - wish I had though I would have gone off!!!! Now, as for the features in our spectacular, spectacular display. The log cabin I constructed out of sticks and cardboard with a bit of fleece and wadding for the roof. I then sprayed the whole thing with fake snow in a can, which was both stinky and weird. 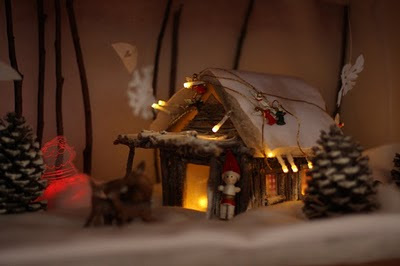 I then lit the whole cabin both inside and out using tiny strands of battery operated lights. So incredibly cute. I then constructed an ice lake/ice skating rink out of opaque plastic, tissue paper and blue fabric. I glued all the layers together and then used a hot glue gun and swirled glue all over the plastic so it looks like people have been skating on the ice. The rink is then lit from underneath with icy white, battery operated, LED lights to give a lovely glow. 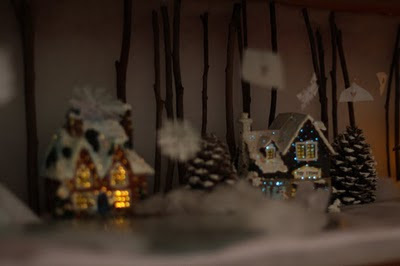 The other little houses, which aren't exactly to scale, but very cute were bought at a junk shop for $15 each and have optic fibre lights inside each. The snowy grounds were made with wadding on the bottom, to give a snowy depth, and with white fleece on top. Stay Tuned for tomorrow's post on the knitted nativity scene.